These cheesy treats contain real, dried cheddar cheese and a mixture of wholesome vegetables and fruits, such as peas, apples, blueberries, carrots and spinach for high palatability in every bite. 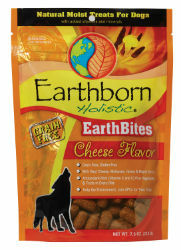 This antioxidant-rich formula will help meet your dog’s daily nutritional needs while satisfying his taste buds. Grain-Free & Gluten-Free.